The photo is pending confirmation from Peru’s Bird Records Committee. RMBO research biologist Rob Sparks said there’s a “high probability” that it’s a Black Swift, although he cautioned that other members of the Cypseloides genus exist in the region making the identification of this sighting difficult. Rob said he’s been in contact with the English team that captured the photo, which included renowned ornithologists, and has seen additional photos of the bird that are convincing. If the photo indeed shows a Black Swift, it would confirm the findings published by RMBO and our partners last March in The Wilson Journal of Ornithology about the bird’s migration path and wintering range. The location of the sighting falls within the location of the Black Swift’s probable wintering range, according to data obtained last year from geolocators retrieved from three swifts. 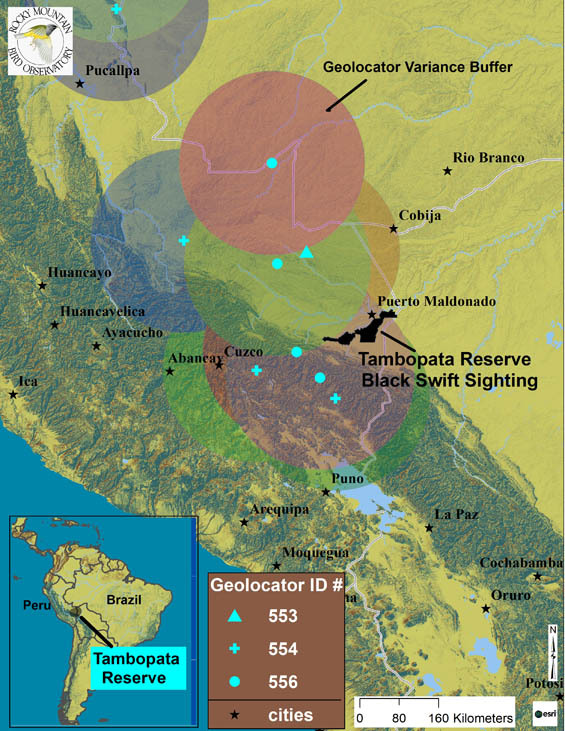 The map above shows the location of the recent Black Swift sighting in Tambopata, Peru, along with the geolocator data.